Nothing quite beats a fresh from the sea fish burger; salmon, halibut, tuna, they're all delightfully delicious grilled as fillets or chopped up with other fresh and flavorful ingredients and turned into healthful burgers. 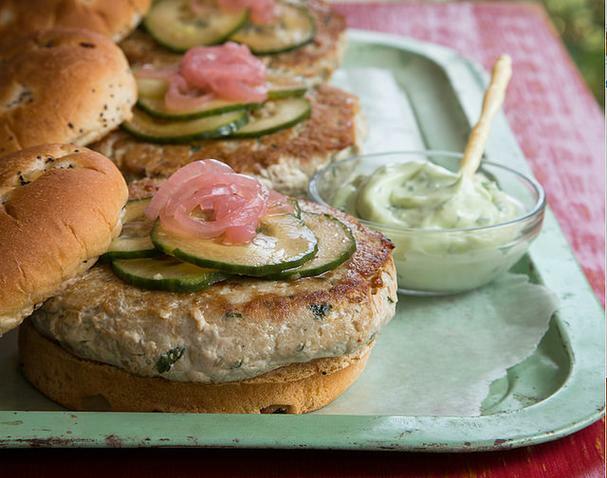 The following tuna burger recipe is full of bright and delicious Asian-inspired flavors like fresh ginger, cilantro, soy sauce, and wasabi. 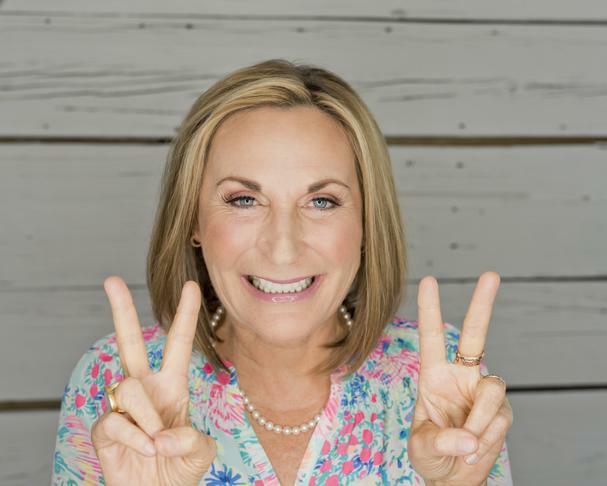 It's from one of my favorite cookbook authors, Lucy Buffett (sister of the famed singer Jimmy Buffett). 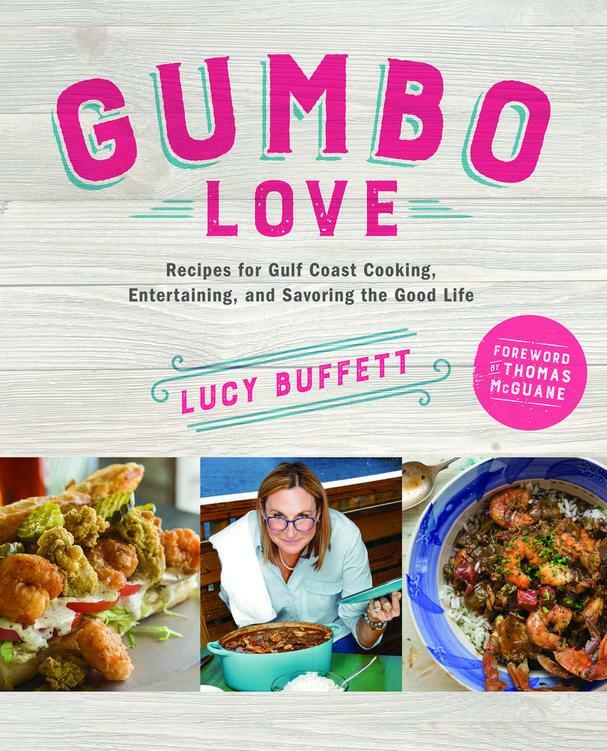 Her latest cookbook, Gumbo Love: Recipes for Gulf Coast Cooking, Entertaining, and Savoring the Good Life, is one you’ll want to cook your way through this summer. Read more about our review of the cookbook and also get her Summer Seafood Gumbo recipe here. 1. Pulse the tuna in a food processor until it is the consistency of ground beef. 2. Remove any stringy fat or membrane from the meat. 3. In a large bowl, combine the meat, ginger, garlic, cilantro, salt, pepper, and egg white and form the mixture into patties. 4. Place the patties on a sheet of waxed paper and refrigerate for half an hour. 5. Coat a grill pan with olive oil spray. Heat the pan over high heat. Once the pan is hot, cook the patties for 3 to 5 minutes on each side, according to your desired doneness. Serve the burgers on buns—or without buns—spread with wasabi mayo, and top with pickled red onions and soy-soaked cukes. 1. Slice the onions very thinly by hand or using a mandoline. 2. Bring a small saucepan of water to a boil. Place the onions in the boiling water for 1 minute, then drain and set aside. 3. In the same saucepan, bring the vinegar to a boil. 4. Add the onion, salt, and sugar and boil for 1 minute. 5. Remove from the heat and let cool. The onion will be a pretty pink color. 6. Pour the onion slices into a jar and refrigerate until ready to use. The onion will keep up to 1 week in the refrigerator. 1. In a small bowl, whisk together the vinegar, soy sauce, sugar, and sesame oil. 2. Add the chili powder and garlic and whisk to combine. Pour the liquid into a 1-quart jar. 3. Add the cucumber slices to the jar, shake, and let sit for at least 15 minutes before serving. 1. Mix the wasabi powder with just enough of the water to form a paste. 2. In a food processor, combine the wasabi paste, mayonnaise, lime juice, soy sauce, and salt. Pulse together until thoroughly combined. 3. Add the cilantro and continue to pulse until thoroughly combined and light green in color. 4. Refrigerate in an airtight container until ready to serve. Serve chilled. Get Lucy's Summer Seafood Gumbo recipe here!